Green Flag Award for the Lower Regents Canal! Congratulations to Dave and Molly from the Lower Regent’s Coalition for all of their relentless hard work! The Regents Canal between Limehouse Basin and Mile End Rd is recognized as one of the UK’s very best green spaces! The Lower Regents Coalition in Tower Hamlets has been recognised by the Green Flag Award Scheme as one of the very best in the world. The Regents Canal between Limehouse Basin and Mile End Rd joins other green spaces awarded recognition in London. The Lower Regents Canal is among a record-breaking 1,883 UK parks and green spaces that will today receive a prestigious Green Flag Community Award – the mark of a quality park or green space. The Lower Regents Coalition maintains the section of the Regents Canal between Limehouse Basin and Mile End Rd in Tower Hamlets. They adopted this stretch of the canal as part of Canal and River Trust’s ‘Adopt a Canal’ programme in June 2013. 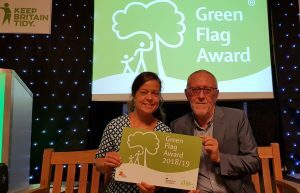 Dave Bedford, Co-Chair of the Lower Regents Coalition said: “We are delighted to receive a Green Flag Award for the first time. It is a fantastic reward for all the hard work our volunteers have put in over the last several years. Molly Gadenz, Co-Chair of the Lower Regents Coalition said: “We are extremely fortunate to partner with some outstanding organisations to receive ongoing support. Without their aid we could not have achieved all that we have to date. Our partners include the Canal and River Trust, LB Tower Hamlets Office of Biodiversity, Moo Canoes, the Ragged School Museum, Thames21, Tower Hamlets Cemetery Park, Tower Hill Trust and Veolia Environmental Services. “We run regular litter picks along the canal but have also taken our work to the next level with our ‘Greening the Regents’ programme. This involves securing grant funding to undertake larger enhancement projects on the canal. To date we have successfully secured over £20,000 in funding to carry out projects such as installing 100m of aquatic plantings in the canal and creating two 150m2 canal-side wildflower meadows. Comments Off on Green Flag Award for the Lower Regents Canal!